A furnace pressure switch is a safety device located near the draft inducer motor of a gas forced-air furnace. The switch is there to prevent operation of the furnace if correct venting air pressures are not detected. A pressure switch is designed to sense the negative pressure created by the draft inducer motor during the furnace startup and to shut down the furnace ignition if the air pressure is inadequate. The draft inducer motor is a blower that creates a flow of combustion air through the furnace's heat exchanger(s) to make sure all combustion exhaust byproducts are vented outside the home via the flue vent. During combustion, the combustion blower creates an air pressure that is less than atmospheric (negative pressure) between the inlet side of the combustion blower and the inside of the burner box of the furnace. The pressure switch, which is normally open (switch is off), senses the drop in pressure and closes to complete the circuit (switch is on). The proper degree of negative pressure differential is necessary to maintain furnace operation. 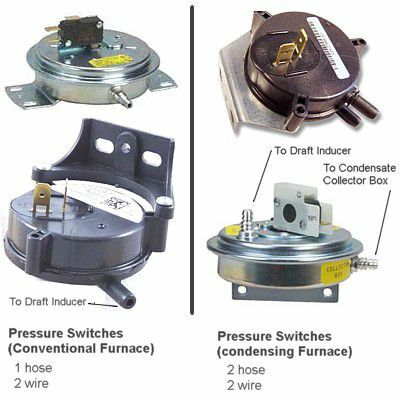 Furnace pressure switches have slightly different designs in different types of furnaces. In a single-stage conventional furnace, there is one pressure switch and it has one hose leading to the body of the draft inducer fan. A single-stage condensing furnace has one pressure switch with two hoses on the switch, one for sensing the pressure at the draft inducer/burner enclosure and the other for sensing proper venting pressure at the condensate collector box. Two-stage furnaces may have two pressure switches, and modulating furnaces may have three pressure switches. The pressure switch on a furnace may fail or get stuck in an open position, and there are few simple checks you can complete before testing the switch for electrical failure. Testing the switch itself requires a multimeter. Turn off the power to the furnace by switching off the disconnect switch located near the furnace. If there is no disconnect switch, turn off the furnace's breaker in the home's service panel (breaker box). Remove the main access panel on the front of the furnace. Inspect the hose(s) connected to the pressure switch to make sure it is connected at both ends and is in good condition. If the hose is cracked, replace it. Remove the pressure switch hose(s) after carefully noting where it is connected (if there is more than one hose, remove and reinstall them one at a time). Make sure the hose is not obstructed inside. Do not blow into a hose that is connected, as this can damage the pressure switch. Use a flashlight to inspect inside the hose port on the pressure switch and make sure there are no obstructions. Remove debris with a small screwdriver or similar tool, being careful not to poke into the switch body. Do not blow into the inlet to remove the obstruction. Reinstall the hose(s). Inspect the ventilation slots on the furnace cover to make sure they are clear of debris. Clean the vents, if necessary. Check the vent pipe for blockage, if the furnace is a condensing type. The vent pipe is a PVC (plastic) pipe typically extending to the roof of the house. Turn off the power to the furnace and remove the access panel. Disconnect the wires connected to the pressure switch by pulling the wire connectors off of the the switch terminals. Set a multimeter to test for resistance (ohms). Touch each tester probe to one of the switch terminals. The tester should read 0 or close to 0 (indicating no resistance). If the reading is higher, the switch has failed and must be replaced by a qualified technician. Reinstall the furnace access panel, and restore power to the furnace. Test the furnace operation.